Pre-Prohibition cobblers are making a cocktail comeback. These refreshers, known for their snow cone-like crushed ice, date back to the 1830s--and some say were named for the bartender’s resembling a shoe cobbler when chipping ice blocks by hand. At The Parish English gastropub, Ricky Yarnall’s not-too-boozy version screams summer. 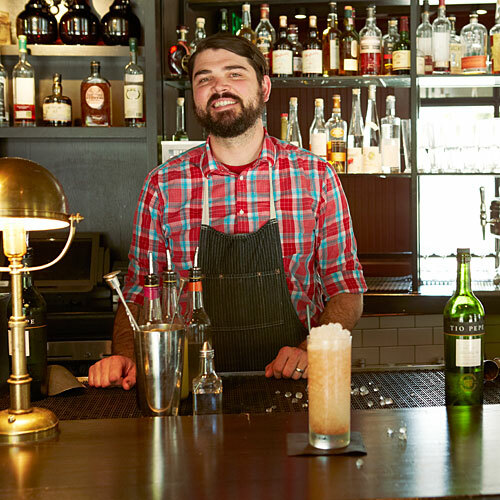 He uses soft pellet ice, dry sherry, lemon juice, berries, and a dash of absinthe. Pair with briny Bluepoint oysters at a seat on the second-story patio, and drink in the lazy nights of summer. Pre-Prohibition cobblers are making a cocktail comeback. These refreshers, known for their snow cone-like crushed ice, date back to the 1830s–and some say were named for the bartender’s resembling a shoe cobbler when chipping ice blocks by hand. At The Parish English gastropub, Ricky Yarnall’s not-too-boozy version screams summer. He uses soft pellet ice, dry sherry, lemon juice, berries, and a dash of absinthe. Pair with briny Bluepoint oysters at a seat on the second-story patio, and drink in the lazy nights of summer.